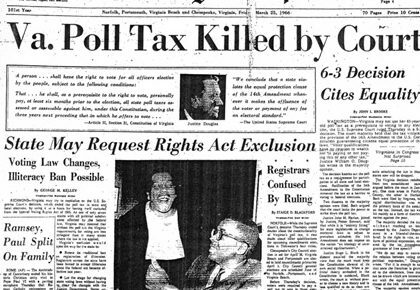 Today is the anniversary of the Supreme Court’s decision in Harper v. Virginia State Board of Elections, which struck down poll taxes in state elections as violating the Equal Protection Clause of the Fourteenth Amendment. Virginia’s poll taxes, enacted in 1902, had preserved Virginia’s place as an elite white man’s commonwealth. But to this day, the United States still allows wealth to be a barrier to political participation, particularly for people of color. Even after slavery was abolished, white people in positions of power discriminated against former slaves, and in both north and south, prevented people of color from having access to economic mobility through segregation, labor market discrimination, and more. Poll taxes were yet another extension of this practice, disenfranchising many African-American voters due to their inability to afford the tax. In 1963, Evelyn Butts, an African-American civil rights activist and mother of three, brought suit in federal court to challenge Virginia’s Jim Crow era poll tax. Her case was combined with a similar one brought by Annie E. Harper, another African-American and a retired domestic worker. Though the recently-ratified 24th Amendment to the U.S. Constitution prohibited poll taxes in federal elections, it made no mention of state elections. The Supreme Court ultimately held that the poll tax violated the Equal Protection Clause of the 14th Amendment, asserting that “the Equal Protection Clause demands no less than substantially equal state legislative representation for all citizens, of all places as well as of all races.” This case was not decided unanimously; there were justices who dissented and tried to uphold restrictions to the polls. In his dissent, Justice Harlan argued that “property qualifications and poll taxes have been a traditional part of our political structure.… indeed it was probably accepted as sound political theory by a large percentage of Americans through most of our history, that people with some property…are consequently more responsible, more educated, more knowledgeable, more worthy of confidence, than those without means, and that the community and Nation would be better managed if the franchise were restricted to such citizens.” But in 1966, those “people with property” were mainly white men who had benefited from slavery and the exploitation of black people, Native people, and other people of color, and prevented those people from accessing wealth. In arguing to uphold the poll tax, Justice Harlan moved to uphold the systematic oppression and discrimination of people of color, further inhibiting their access to economic mobility. Justice Douglas addressed the dissenters in his majority opinion, stating that “in determining what lines are unconstitutionally discriminatory, we have never been confined to historic notions of equality.” He acknowledged the unfairness of a system biased towards white people with means. With slavery abolished and more African-Americans fighting for their rights, he realized that suffrage was too fundamental a right to dilute. The majority opinion struck down wealth discrimination in the voting process, a watershed moment for disenfranchised black voters. The Court was forceful in its assertion that wealth should not be a factor in one’s ability to cast a ballot. The case was notable in that it was the first time that the Supreme Court recognized that wealth discrimination is prohibited in the political process under the Constitution. Unfortunately, this wealth discrimination is still entrenched in our political system today. In the decades since the Harper decision came out, the influence of wealth has had an increasingly drastic impact on the electoral process. Regular voters face a new type of poll tax through the escalating costs of political campaigns. Candidates who want to run for office must first participate in the “wealth primary” in which they must raise large amounts of money from wealthy donors in order to even be able to present their views. Only by partaking in this so-called wealth primary do candidates gain access and influence; in return, their wealthy donors can influence the terms of the debate and the issues to focus on. The Supreme Court’s 2010 Citizens United decision exacerbated this issue by allowing unlimited spending from corporations and undermining the basis for limiting big money in politics more broadly. Economic power is now more easily translated into political power, which is in direct conflict with the Supreme Court’s decision in Harper that wealthy people should not have more say in the political process. The ability for those with wealth to influence the terms of the debate is even more concerning when considering the disconnect between how the wealthy and the general public view public policy issues. For example, while fifty percent of the general public believe that the government should provide a decent standard of living for the unemployed, only twenty-three percent of the wealthy support this policy. And even when those with the ability to influence public policy outcomes do support policies for upward mobility, they often do not prioritize those policies over other goals that would benefit them, such as lower taxes. So, when the wealthiest Americans are legally able to govern who runs for office and which issues are addressed in political debates, the votes of average American citizens are diluted through a corrupt political process in which only those with money can participate. It should come as no surprise that large donors are more likely to be wealthy, male, and white. The campaign donors who donate a significant percentage of overall funds are overwhelmingly white. This dominance of white donors has significant ramifications for people of color. Candidates running for office are less likely to prioritize issues that are important to Americans of color, whereas they give more priority to issues of the elite donor class whom they rely on for fundraising. Furthermore, people of color are underrepresented in elected office because they find it more difficult to compete in the wealth primary necessary to be competitive in campaigns without access to networks of wealthy (white) donors. This system ensures that only those who are already wealthy, or those whose policy positions appeal to the wealthy class of donors, can run for office and have their issues addressed. Throughout its history, America’s forms of discrimination have prevented communities of color from generating wealth. Our laws are set up to prevent equal access to our economic and political systems. For African-Americans, this disparity can be traced to public policies such as slavery, Jim Crow, school segregation, and other policies that have inhibited them from accessing opportunities to promote economic growth and accumulate wealth. In 1902, Virginia took advantage of this wealth disparity to prevent poor black residents and other people of color from participating in the political process. In 2018, wealthy white donors take advantage of this system to advance their own agenda, further harming communities of color. The Harper case banned poll taxes, but it did not go any farther in preventing wealth discrimination in the political process. The Harper decision emphasized that states could not discriminate in the political process on the basis of economic status, but the wealth primary has done just that. This wealth primary barrier prevents American citizens from participating in the political process on an equal basis. The people who are most adversely impacted by this unequal influence are those who are already facing discrimination and oppression in other areas of life. Fifty-two years after the Harper court held that “the right to vote is too precious, too fundamental to be so burdened,” many Americans are still being denied the rightful value of their vote. That’s why we need a constitutional amendment to get big money out of politics and ensure political equality for all. This entry was posted in Constitutional Amendment, Supreme Court and tagged 28th Amendment, campaign finance reform, citizens united, Poll Tax, Wealth Primary.